I try not to be an accidental traveler. This means that before leaving for new destinations, I consider where to live, how to get to and from the airport, what to see and where to eat. I have already started my preparations for my trip to Lyon due in two weeks time. This as a part of the whole traveling experience. I have already created at map, before takeoff, plotting in where I stay, how to get there. As I return to my flat to write on my trip, I will develop the map in order to explain to you all what I experienced during my four days in Lyon. What preparations have I done until now? I have already booked my hotel at www.venere.com. Grand Hôtel de Terreaux is a four star hotel, located in the old part of Lyon. €216 for a single room for three nights in such a hotel should be a bargain. I will give you a full review of the hotel as I return. For now you may see the description of the hotel on www.venere.com here. May 23rd, I will arrive at Lyon Airport at 8.30 PM. The firm Satobus operates a bus service every 20th minute from the airport to the city centre. The trip takes 50 minutes all in all. It has five stops before the end stop at Lyon Perrache. I will leave the bus at Lyon Part Dieu, 30 minutes from the airport. From Part Dieu it will take me 20 minutes to walk to my hotel. This means I will arrive at my hotel around 10.15 PM. And where to look to find out what sights to see in this historic city? 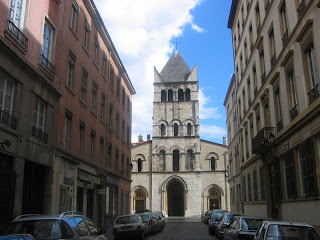 I particularly look forward to see the old city of Lyon, a UNESCO World Heritage site. The traboules, narrow medieval passage ways typical of Lyon. Lyon is the culinary capital of France, so I look forward to good food and wine. I have, however, to do some more research on restaurants and taverns. I will return to this point later. In short - I do look forward to my little adventure already.